Tourism is very limited on the two islands in order to preserve the Hawaiian past and present. For somewhere truly remote in Hawaii, consider the islands of Niihau and Kaho‘olawe. Both sharply limit tourism to preserve the Hawaiian past and present. But for armchair travelers, or the few who manage to get to the islands, they offer a fascinating look at Hawaii’s past — and future. 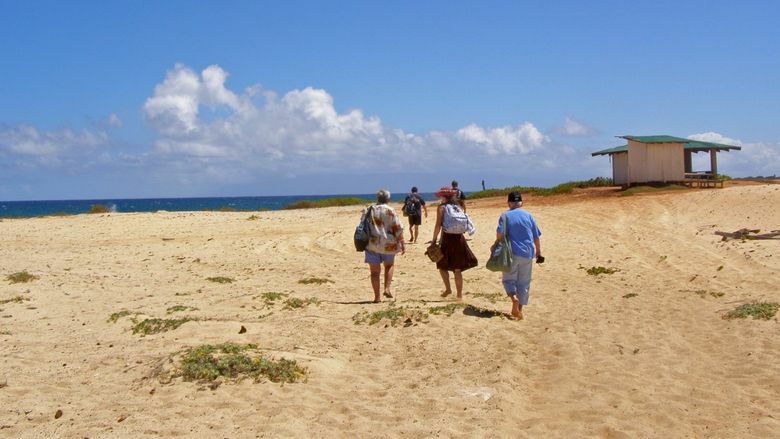 Off Kauai, Niihau is a mostly deserted island that’s been owned by the Sinclair/Robinson family since 1864. Nicknamed the “Forbidden Island,” it indeed remains mostly closed to outsiders. 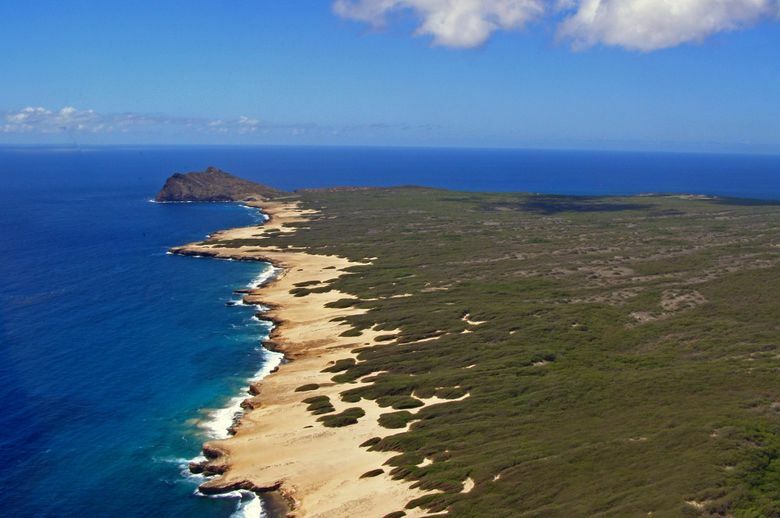 The only tourists allowed on Niihau, 18 miles across a rough ocean channel from Kauai, are those few who join an owner-controlled half-day helicopter tour or a hunting safari day trip (for feral sheep and eland, an antelopelike creature that was introduced to the island). I took a Niihau Helicopters tour several years ago. It was expensive and the scheduling/organizing was tricky, but it was an exhilarating and utterly memorable half-day trip. The former military pilot took a half-dozen of us scudding above the channel, obligingly tilting the helicopter so we could get a better look at massive humpback whales undulating through the waves below. Reaching the 72-square-mile island, we surged over cliffs, beaches and scrubby trees. The helicopter lands at a deserted white-sand beach far from the island’s only village, a tiny scattering of simple houses where the Hawaiian language is still in use. There’s no interaction with the islanders in order to preserve their privacy. Walk the deserted beach or swim and snorkel. 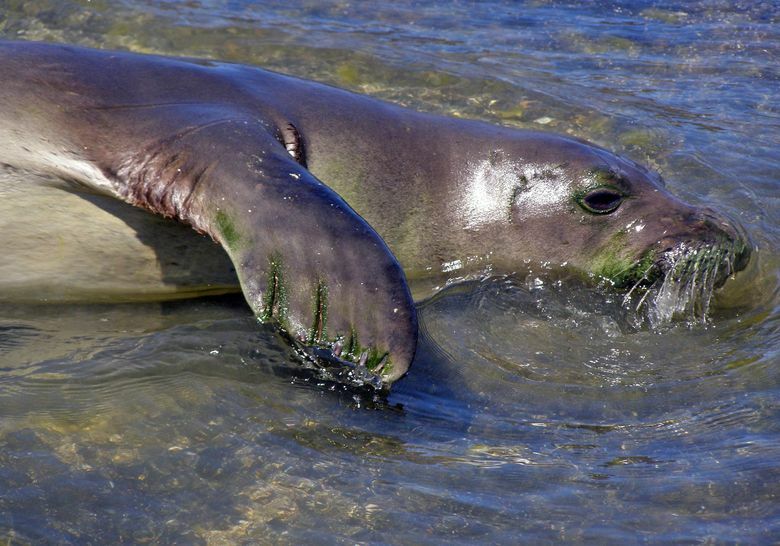 In an hour’s walk, I reveled in the peacefulness and wild things, watching monk seals snooze on the beach and Laysan albatrosses huddle on their ground nests, long white wings tucked tight. And, with the pilot’s permission, I collected some of the tiny spiral shells from which islanders painstakingly make shell leis sold at Kauai shops. Niihau Tours: $385 per person, plus $15 handling charge, for the half-day helicopter tour. Two tours daily, Monday-Saturday, but tours depart only if there are at least 5 people. Plan ahead and be flexible on dates. niihau.net or 877-441-3500. Other companies advertise Niihau snorkel/dive tours, but since Niihau is a private island and landing is forbidden, they mostly head to nearby Lehua Crater, an uninhabited crescent-shaped island that’s part of the cone of an extinct volcano. 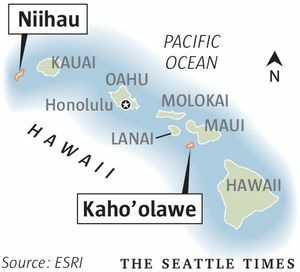 Off the coast of Maui sits the 45-square-mile Kaho’olawe island, the smallest of the major Hawaiian islands and one with a grim recent history. After decades of Hawaiians’ protests, the bombing was halted and the island transferred to the state of Hawaii in 2003 after much (but not all) of the unexploded ordnance was cleared. The island is administered through Kaho‘olawe Island Reserve Commission, and is designated as a place for the perpetuation of Native Hawaiian culture. Access to the undeveloped Kaho’olawe is strictly limited and there are no commercial activities or tours. Erosion control and restoration of historic sites is going on with the help of a small number of volunteers, mostly from Hawaiian educational and cultural groups (and with a long waiting list). 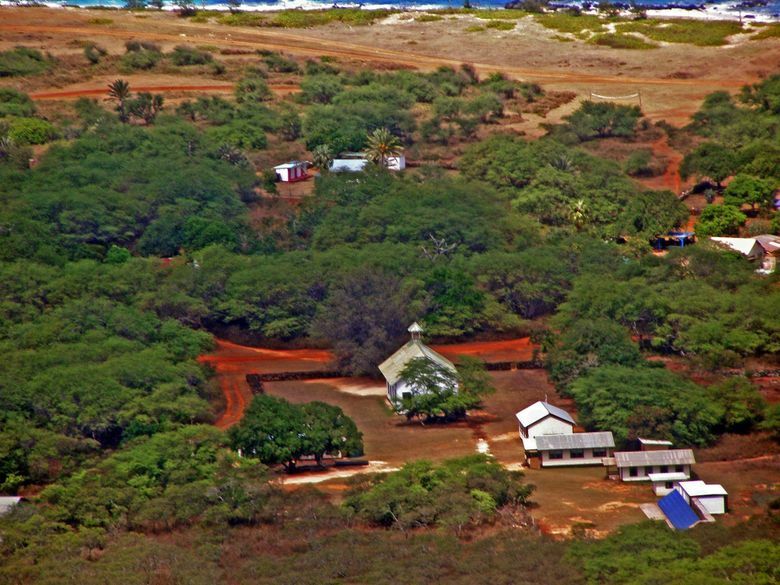 However, the commission is running out of funding — and the future of Kaho’olawe is again becoming a hot-button political issue. For now, most visitors will have to be content to gaze at Kaho’olawe from south Maui (around Kihei and Wailea). Or get a virtual look via the commission’s Facebook page, facebook.com/KircMaui, and its website, kahoolawe.hawaii.gov.